What would be included in a general daily routine for my child in Head Start? Classroom time includes a large variety of activities. Often teachers begin the day with a circle time activity. They may also sing, dance, do finger plays, or have story time. They may have short lessons about studies they are doing. Children work individually, in small groups, and in large groups. What can Head Start offer my family? Head Start offers the family a chance to be involved in activities and events to help your whole family. Parents and guardians can take training and classes on a variety of subjects, such as child rearing, parent education, health and nutrition, and making use of free resources in the local community. Families may get referrals to medical, dental, social welfare, mental health, or employment specialists in the community. Why do the children go out to play every day, even when the weather is cold? Children need to develop their large muscles and skills through outdoor play. However, if the weather is extremely inclement, the children will stay in and do motor development activities in the classroom or multi-purpose room. My child was evaluated by the school district for speech concerns and did not qualify for school district services. I still have concerns. Is there anything I can do? The school district can do another evaluation six months after the last evaluation if there are still concerns. In the meantime, children may receive extra help in the Head Start class in which they are enrolled. 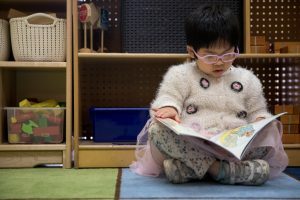 Will my child learn to read in Head Start? We give children several opportunities to gain “pre-reading” skills. They have activities where they learn to recognize their name and identify letters. As their skills progress they will be given opportunities to develop reading skills. May I bring my other children with me when I visit my child’s classroom? Although we love children and families, when you visit in the classroom, it is a special time to focus exclusively on your Head Start child. I have a responsible 12-year-old child. Since I am not able to volunteer in the classroom, may he/she volunteer? Older siblings, who are volunteering in the classroom in place of a parent, must be at least 16 years of age and have advance permission from the teacher. What is the purpose of assessments? Assessment of each child assists teachers in planning activities the children are interested in, in recognizing each child’s current strengths and reinforcing them, and in providing children with opportunities to gain new skills. My child’s class starts at 8:00 am, and my other children have to be at school at 7:45am. Is it okay to drop my Head Start child off at 7:30am? No. Although we try to be as flexible as possible, we have to be very strict with our class times. Teachers use the time before and after class to prepare for the day. 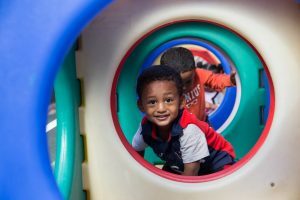 Early Head Start is a prenatal to age three, infant-toddler program for low-income families designed to nurture and support parents and children by building on families’ strengths. What do services to pregnant women include? Early Head Start offers supportive services as early in life as possible. Our program provides services to pregnant women and their families and through the child’s first three years of life until they are ready to transition to Head Start or another pre-k program. How much does enrollment at Champaign County Head Start cost? For the Head Start/Early Head Start portion of the day (up to 3.5 hours) it costs NOTHING. Because Head Start is a federally funded program, our 3.5 hour/day classes and activities are free to all who are enrolled. For the extended portion of the day (from 3.5 hours up to 10 hours), the childcare cost is based on family income, allowing our families the full-day option in order to work and/or attend school. The federal poverty guidelines system determines a family’s need. “Persons in Family” are the number of blood relatives of your child (including the child) living in the home and being supported by the income. Families that meet less than the listed gross income for the number of people in their household qualify for Head Start. What if my family is over the income limit? Head Start and Early Head Start are federal programs developed to help families based on need. That means that families below the federal poverty guidelines and children with disabilities are enrolled first. However, if we continue to have spots open, we then pass those openings on to the families that do not meet the guidelines but have the greatest need. What if my family receives food stamps? Receipt of food stamps does not mean your child automatically qualifies—it will still depend on income based on the federal poverty guidelines. If you are unsure if your child qualifies, feel free to contact us. Most classes are held for 3.5 hours each day, Monday – Friday. Morning sessions start at 8:00 am and go until 11:30 am, while afternoon sessions start at 1:00 pm and go until 4:30 pm. Full-day options (both six-hour/day and 10 hour/day) operate from 7:30 am until 5:30 pm. I turned in an application weeks ago and still haven’t heard anything. What now? An application isn’t complete until you’ve met with your family advocate and turned in your income information and your child’s birth certificate. If you’ve done all of that and still haven’t heard anything, it means that your child is on our wait list. What if the child’s biological parents don’t live with him/her? You can still fill out an application if you have adoption papers or a letter from the parents saying you have permission to do the application. What is the wait list and how does it work? Everyone that applies to enroll in Head Start is automatically placed on the wait list. During the summer we enroll the children with the greatest need to start in the fall. 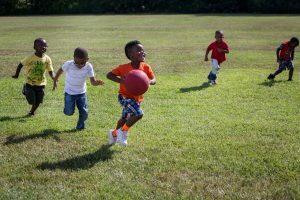 As spots open during the school year due to children moving or otherwise leaving the program, we enroll the next child with the greatest need. We reevaluate and fill our open spots monthly during the school year. Does needs-based mean that my child’s position on the wait list isn’t based on when I enroll? Yes, that’s exactly what it means. We have limited transportation to several of our sites and we help to promote carpooling. Are there additional forms that need to be completed? After you have called the Administrative Office ((217) 328-3313) and been put on an interest list, an intake specialist (family advocate) will contact you to set up an appointment to apply for the program. At that time, the advocate will indicate which special health forms should be completed. These include the Special Meal Plan form, the Child Health Plan form, and the Authorization to Administer Medication form. Feel free to talk to your family advocate or to call our administrative office at (217) 328-3313.